Martin O'Neill pictured during tonight's game. 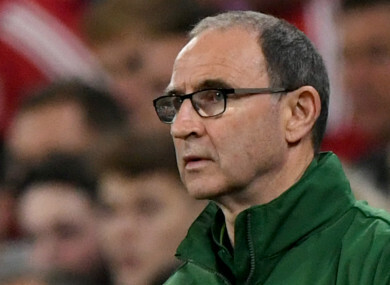 MARTIN O’NEILL SAID he hoped Harry Arter and Declan Rice would rejoin the Irish squad after his players bounced back from a thrashing by Wales to draw 1-1 with Poland in Wroclaw. Audio recordings of Ireland’s Stephen Ward discussing a row between Arter and O’Neill’s assistant Roy Keane emerged after the Bournemouth midfielder, currently on loan at Cardiff City, put his international career on hold while he considers his options. Rice, meanwhile, is considering interest from England but O’Neill was in a positive mood about the possibility of the pair joining his squad for Ireland’s Nations League games against Denmark and Wales in October. “That would be nice and in an ideal world that would be terrific,” said O’Neill, when asked whether Rice and Arter would join up with his players next month. Aiden O’Brien scored on his debut to give Ireland the lead early in the second half against Poland and the visitors’ defence was notably stronger than it had been five days earlier when Wales scored four at Cardiff City Stadium. Poland substitute Mateusz Klich eventually broke the Irish resolve with a late equaliser but O’Neill was pleased by the improvement he saw in his team. “It was a brilliant effort by the players and we will step forward for the two games now next month,” he told reporters. Opposite number Jerzy Brzeczek praised his side’s performance and suggested that Poland are starting to recover from a disappointing showing at the World Cup, where they crashed out at the group stage. He said: “This team began to function well, not only on the pitch and training, but also in other situations. Email “O'Neill hopeful of Arter return after Keane row”. Feedback on “O'Neill hopeful of Arter return after Keane row”.